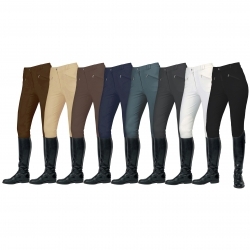 The Ladies Gisborne breeches are designed to be practical for everyday use, but are also smart enough to stand out at events. The 4-way stretch fabric is made from a cotton, Polyamide and Elastane mixture. This combination makes a durable, comfy and breathable fabric to work and ride in. It is also machine washable on a cool wash. These breeches offer a self-fabric Euro seat, ultra-grip knee patch with embossed logo and a wide 4cm waistband with belt loops. There are two front pockets for your convenience and an embroidered Mark Todd logo.